Ageless Stories. Ageless Photos. Nostalgia Magazine relives the days when teenage couples sipped milkshakes at the soda fountain, when families gathered around the radio for nightly entertainment, when men wore hats in public and ladies only wore dresses. See below for our current subscription specials, including two-year subscription and book combos, including our Nat Park book. Get your daily dose of history, heritage and memories in a bi-monthly print magazine delivered straight to your door by a real letter carrier. Read fantastic stories about life from years gone by, written by fellow readers, and also, discover new books, museums, historical societies, and preservation organizations doing the hard work of preserving our shared history and heritage for generations to come. Nostalgia Magazine covers a wide spectrum of historical topics from entertainment to civics to local landmarks and beyond. Learn about war heroes, pioneers, marshals and deputies, musicians, scoundrels, shopkeepers, everyday folk, and now and then, a few weirdos. Nostalgia Magazine is delivered six times per year, in January, March, May, July, September, and November. Order your subscription today, for yourself, or for someone you love. 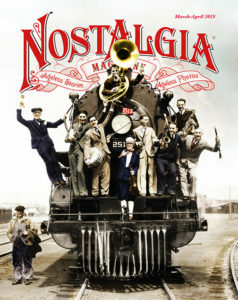 Nostalgia Magazine makes a great gift for parents, grandparents, aunts, uncles, cousins, friends – anyone who loves to connect with the history and heritage all around them. 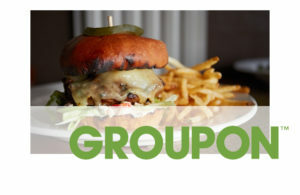 Call (509) 443-3678 to order. Or, send a check for $24.95 for one year, or $48.95 for two years, along with your mailing address, to Nostalgia Magazine, PO BOX 8466, Spokane, WA 99203. 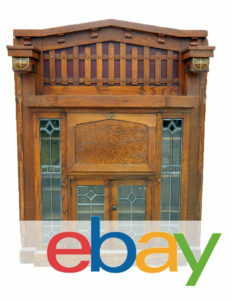 Or use the menu below to select the number of years, and then click “Buy Now” to purchase online. Pre-order “Not Forgotten: A Pacific Northwest Family Brings Their Soldier Home” by Dave Reynolds! Order the book for $30 (including shipping and handling), or a book and 2-year subscription bundle for $60 (including shipping and handling). “Not Forgotten” tells the heroic story of Lester “Verne” Zornes, who served during World War 2, and whose plane mysteriously crashed in Africa just a few months before the historic D-Day invasion. Learn more about “Verne” Zornes here. 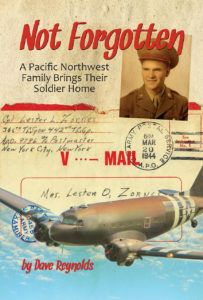 “Not Forgotten: A Pacific Northwest Family Brings Their Soldier Home” will ship by May 1. Click “Buy Now” to order a 2-year subscription to Nostalgia Magazine, plus “Not Forgotten: A Pacific Northwest Family Brings Their Soldier Home” for just $60 (includes shipping and handling). Pre-order “The Lion in the Shadows: E.J. 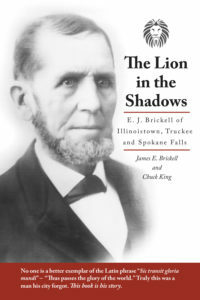 Brickell of Illinoistown, Truckee, and Spokane Falls” by James E. Brickell and Chuck King! Order the book for $30 (including shipping and handling), or a book and 2-year subscription bundle for $60 (including shipping and handling). Brickell and King’s book on E.J. Brickell will introduce you to one of Spokane’s most forgotten founders, a man who once owned most of the area that is today known as Riverfront Park. Learn more here about E.J. Brickell. The Lion in the Shadows is in stock and ready to ship! Click “Buy Now” to order a 2-year subscription to Nostalgia Magazine, plus “The Lion in the Shadows” for just $60 (includes shipping and handling). 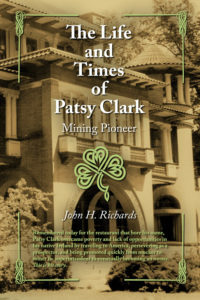 Pre-order “The Life and Times of Patsy Clark: Mining Pioneer” by John H. Richards! Order the book for $30 (including shipping and handling), or a book and 2-year subscription bundle for $60 (including shipping and handling). Richards’s book will take you beyond the Patsy Clark mansion and famous restaurant to the man himself, Patrick Clark. Learn more here about Patsy Clark. The Life and Times of Patsy Clark is in stock and ready to ship! Click “Buy Now” to order a 2-year subscription to Nostalgia Magazine, plus “The Life and Times of Patsy Clark” for just $60 (includes shipping and handling). Get “Spokane: Our Early History” – a 310 page book by Tony and Suzanne Bamonte, and commissioned by the Spokane Association of Realtors – when you order a two year subscription or renewal to Nostalgia Magazine for yourself or someone you love. “Spokane: Our Early History” is full of rare photos and stories about the founding of Spokane, including stories about the Great Fire, the first newspaper, cars, and trains, the Age of Elegance, and more. Limited quantity available! Click “Buy Now” to order a 2-year subscription to Nostalgia Magazine, and get “Spokane: Our Early History” free! Total cost: $53.90, includes shipping and handling. 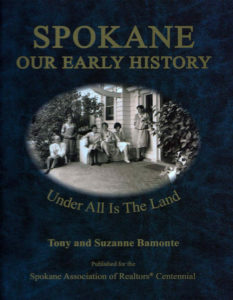 To get the “Spokane: Our Early History” book only, please order directly from the authors, Tony and Suzanne Bamonte. 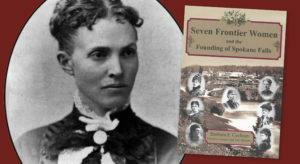 Get “Seven Frontier Women” – a 294 page book by Barbara Cochran full of rare photos and stories about seven of Spokane’s most tenacious pioneer women – when you order a two year subscription or renewal to Nostalgia Magazine for yourself or someone you love. Seven Frontier Women and Nostalgia Magazine make great gifts for anyone! Limited quantity available. Click “Buy Now” to order a 2-year subscription to Nostalgia Magazine, and get Seven Frontier Women free! Total cost: $53.90, includes shipping and handling. 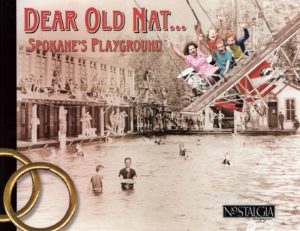 Get “Dear Old Nat” – a 140 page book full of rare photos and stories all about Spokane’s famous trolley park – when you order a two year subscription or renewal to Nostalgia Magazine for yourself or someone you love. Dear Old Nat and Nostalgia Magazine make great gifts for anyone! Click “Buy Now” to order a 2-year subscription to Nostalgia Magazine, and get Dear Old Nat free! Total cost: $53.90, includes shipping and handling.